July | 2016 | Renowrites blog! 1998. George Washington University. Filipino Intercollegiate Networking Dialogue (FIND). 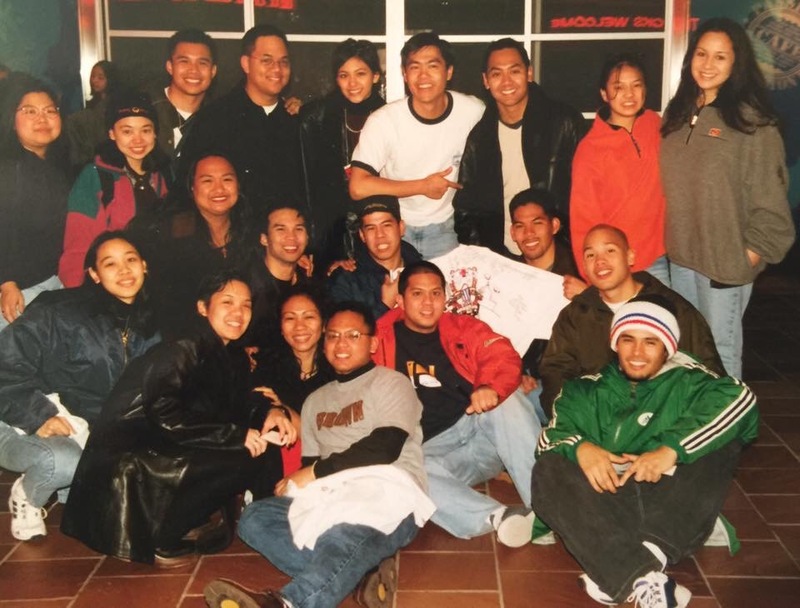 A time in my life I traveled the country networking with fellow young Filipino Americans to empower and educate, as well as deejay for hundreds of people a night. I miss these great people in the photo below. We came from different parts of the country to network and dialogue, all starting our careers or graduate school endeavors when this photo was taken. Today, I remember Gigi Miranda and Joe Montano, two contemporaries in this photo who passed away too young this month. Gigi lived a fabulous life in Hawaii as an AINA chef on the islands and worked with the Kokua Hawaii Foundation. I’ll always remember her for her beauty and kindness. Joe lived an active life in Virginia, serving as the Manassas VA Regional Director for Democratic Party VP and US Senator Tim Kaine. For many years, he served as Executive Director of the National Federation of Filipino American Associations (NaFAA). I’ll always remember him for his smile and gregarious personality. His presence at the Democratic National Convention is felt in Philly. #DNC #DemsinPhilly. Tributes have poured in. So many great stories can be told from each of these perspectives. Another heavy reminder not to wait, but continue to write. It’s been two years…but I’m back! I’ve emerged from the ashes of routine and attended Comic Con 2016. Mostly to give my growing kids a chance to experience the Comic Con madness. Not enthused to attend, they quickly discovered the fun of taking photos with characters from a comic book or movie. Can’t you tell! Smile! I attended a Literary agent panel and the #Superasianamerican panel on Sunday July 24th. I found the Literary Agent panel fascinating. The last industry panel I attended was years ago when Vampires were the deal. So much has changed since then! Self publishing was becoming the distribution model of choice for many authors. Traditional authors weren’t sure how to deal with the changing landscape. Fast forward to 2016 and there is enough sample size to argue self publishing can work against an author. The last few years, I’ve been writing and editing my manuscripts. I haven’t sent out query letters. I guess I just wanted alone time with my stories. To find my voice as a writer without outside distractions. But I’ve been my own worst enemy -I coach basketball like a madman! I’m a Varsity high school basketball coach and run an AAU program with 15+ teams. I commute two hours a day, which has me think about my characters and what they should do next. When should I have Dorothy trust Adrian? Or when should Monika move on? Two manuscripts. Two completely different stories. 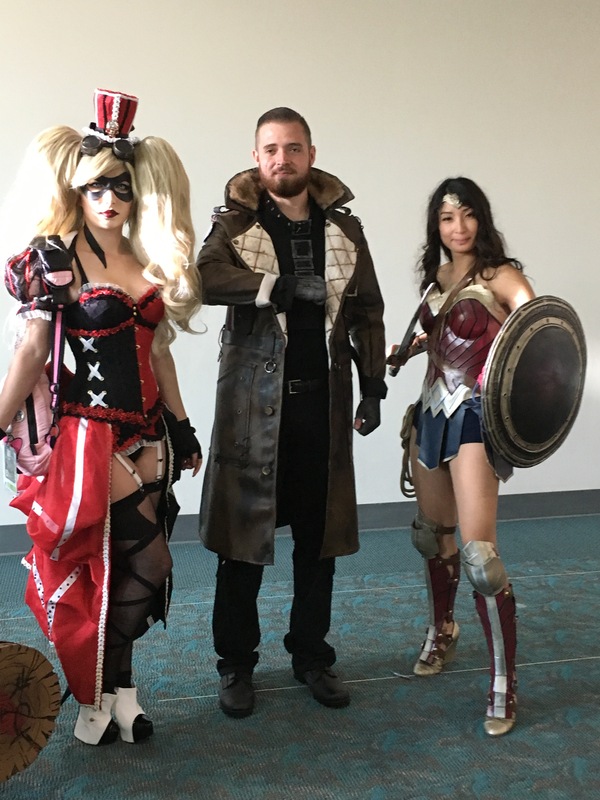 Maybe I should just have them dress like these Comic Con crazies! Does anyone know who these characters are? Anyway, I digress. 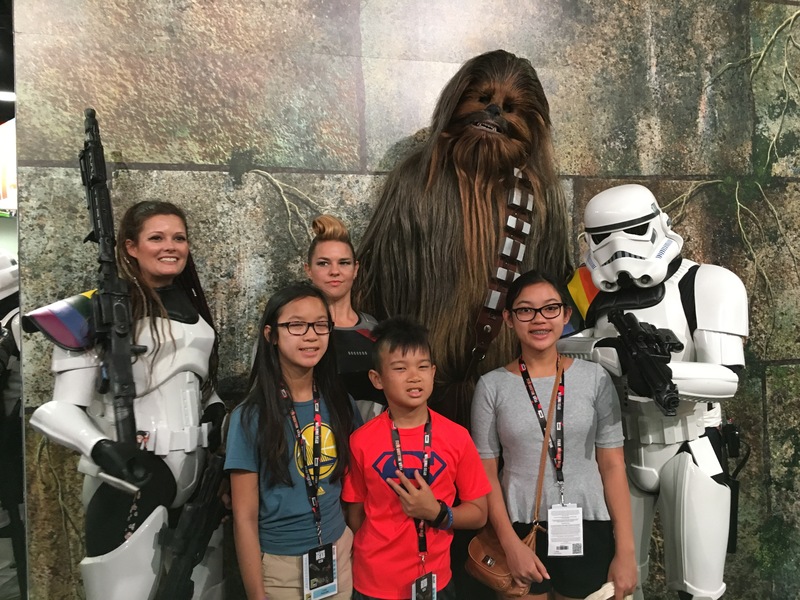 I had a blast seeing my kids enjoy their first Comic Con experience. I won’t let my writer’s angst deter me from ensuring they have a beautiful childhood.